The Silverado 2500 HD is a heavy-duty version of Chevy's full-size pickup offering a powerful V8 engine or an even stouter turbodiesel. The 2013 chevrolet silverado 3500 hd extended cab electric vehicle qualifies for a federal tax credit of up to $7,500, effectively reducing the net base price. The Silverado 2500 HD and 3500 HD trucks are Chevrolet's line of heavy-duty pickups meant for hauling big loads and other applications where power is the priority. Like its GMC twins the Sierra 2500 HD/3500 HD and heavy-duty rivals from Ford and Ram, the Silverado HD comes in a variety of trims, from just-the-basics to versions with leather interiors and premium sound systems. Also like its rivals, the Silverado 2500 HD and 3500 HD can be had with a gasoline or diesel engine, the latter of which has exceptional – but not class-leading – towing capacity. For 2013, a bi-fuel system is available on the 2500 HD that can run on gasoline or compressed natural gas, the latter of which has the potential to provide cost savings depending on where fuel prices go. If you've been a longtime Chevy Silverado HD fan and it's time to trade in your old rig, the features in the 2013 model should help you remain loyal. For those looking to potentially save fuel costs, the compressed natural gas option may make the Silverado 2500 HD more tempting. Even the most powerful Silverado HD won't grant you bragging rights when it comes to towing ability and torque. In the never-ending quest for "best in class" for those stats, the leader (at least for 2013) is the Ram 3500 with its 30,000-pound max trailering capacity and 850 lb-ft of torque. A bi-fuel system is available on 2500 HD models with the 6.0-liter engine and extended cab. With it, the truck can run on regular gasoline or compressed natural gas (CNG). Also, the Duramax 6.6-liter V8 diesel engine is now available on 3500 HD chassis cab models. After testing several Silverado HD trucks with gasoline and diesel engines, long and short beds, and in various trim levels, we found all exhibited a firm suspension, good steering ability, and a fairly compliant ride. We are particularly fond of versions with the 6.6-liter Duramax diesel V8 under the hood that boasts 397 horsepower and a stout 765 lb-ft of torque. When pulling a 10,000-pound trailer, the 2500 HD had no qualms whatsoever. The 3500 HD model with that engine can pull 18,000 pounds in conventional towing, and 23,100 in fifth-wheel setups. The diesel engine is a bit loud, but once inside the passenger compartment much of the noise is mitigated. This feature on diesel models works by progressively restricting the engine's exhaust, depending on speed and grade of descent, to help slow the truck using compression braking. Available on 2500 HD extended-cab models as an $11,000 option, this system enables the Silverado to run on traditional gasoline or compressed natural gas. The CNG tank takes up some bed space near the front, but can potentially save you money by using the alternative fuel. The 2013 Chevy Silverado HD's interior varies widely depending on what trim and cab configuration you choose. A base WT model with regular cab, for example, seats three on a vinyl bench and has few frills, not even power windows. It's made to be exactly what its initials stand for: a work truck. Extended-cab models, meanwhile, expand passenger count to six with a rear bench. Crew cabs are also configured to seat six or, with individual front seats, five. Foremen, meanwhile, can appreciate the premium, leather-lined accommodations of LTZ models. When properly equipped, the Silverado HD can serve as a rolling office thanks to multiple power outlets and the option of becoming a mobile Wi-Fi hotspot. The 2013 Silverado HD comes in two flavors: the 2500 and 3500, representing 3/4-ton and 1-ton models. Though each shares the boxy overall element of the Silverado 1500, these heavy-duty versions are even bolder with a larger chrome grille and a raised power-dome hood. The even-heavier-duty 3500 models can be had as a dualie with a pair of dual rear wheels. If you plan to park your Silverado HD in the garage, make sure it can fit. Even with a regular cab, at 225 inches, the Silverado HD is more than two feet longer than the Chevy Impala full-size sedan. Crew-cab versions with a long box, meanwhile, measure 259.1 inches, or over 21 feet in length. 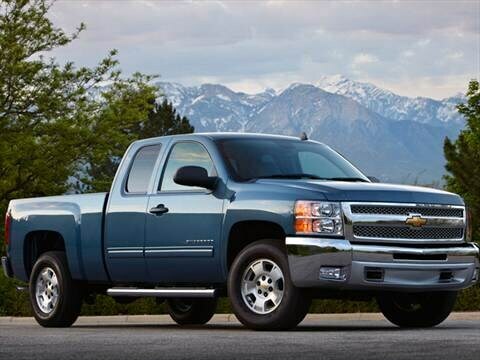 In base WT form, Silverado HD models won't exactly baste you in luxury. These are work trucks through and through, and part of that work will be cranking your own windows unless you pay for the option or upgrade. However, the base models are equipped with a powerful V8, 4-wheel antilock disc brakes, stability control, air conditioning, cruise control, an AM/FM stereo, and a heavy-duty handling/trailering suspension package. LT trims add features such as power windows/doors, a CD player and premium cloth seating. Top-line LTZ models come with steering-wheel-mounted controls, Bluetooth, Bose premium sound, leather seats and a heavy-duty locking rear differential. All 3500 HD models get the locking differential and heavy-duty trailering equipment. All trims of the 2013 Silverado 2500 HD and 3500 HD can be had with the more powerful Duramax 6.6-liter turbodiesel engine, as well as 4-wheel drive in place of the standard rear-wheel drive. Other options vary by trim, and range from power windows and door locks in base models to a rearview camera and heated and cooled leather seats in top trims. Creature-comfort options include a touch-screen navigation system and premium audio, while work-related add-ons include an EZ-Lift tailgate, snow-plow prep package and dual 125-amp alternators. 2500 HD models with the 6.0-liter V8 and extended cab can be equipped with a bi-fuel system that enables the engine to run on gasoline or compressed natural gas. Two engines are available on 2013 Chevrolet Silverado HD models: a 6.0-liter gasoline V8 that's flex-fuel capable, or a 6.6-liter turbodiesel V8 that can run on B20 biodiesel fuel. For 2013, the gasoline engine can be modified as a factory option to also run on compressed natural gas (doing so lowers power output). In addition to offering much more power than the gasoline engine, the diesel offers an exhaust braking feature to help slow the truck on descents. To reduce emissions, the diesel engine uses a urea-based fluid in a 5.3-gallon tank that needs to be replaced every 5,000 miles. Both engines are linked to 6-speed automatic transmissions, with a heavy-duty Allison 1000 available for the diesel. The EPA does not rate the fuel economy on heavy-duty trucks such as the Silverado 2500 HD and 3500 HD. A base 2013 Chevrolet Silverado 2500 HD with regular cab has a Manufacturer's Suggested Retail Price (MSRP) starting at just over $30,000. Load up a 4-wheel-drive 3500 HD with a diesel engine (a roughly $7,000 option alone) and all the trimmings, and you can double that price beyond the $60,000 mark. The Chevy's starting price is in line with those of heavy-duty truck rivals from Ford and Ram. Before buying, be sure to check the Kelley Blue Book Fair Purchase Price to see what others in your area are paying for the 2013 Silverado HD. The Silverado HD's resale value runs right in line with the Ford F-Series Super Duty and Ram 2500/3500, with residuals varying a bit depending on trim level and cab configuration. In general, diesel models have a slightly higher resale value vs. those with gasoline engines. Great TRUCK for towing and pulling. This is the best truck i have owned.